Avalanche transistors can be used to generate fast rise time pulses. Their usage in the hobby world was made popular following an application note (AN72) by Jim Williams and was further publicized via this EEVBlog video. 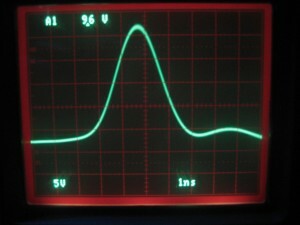 Many people have built such avalanche pulse generators for oscilloscope bandwidth measurements. 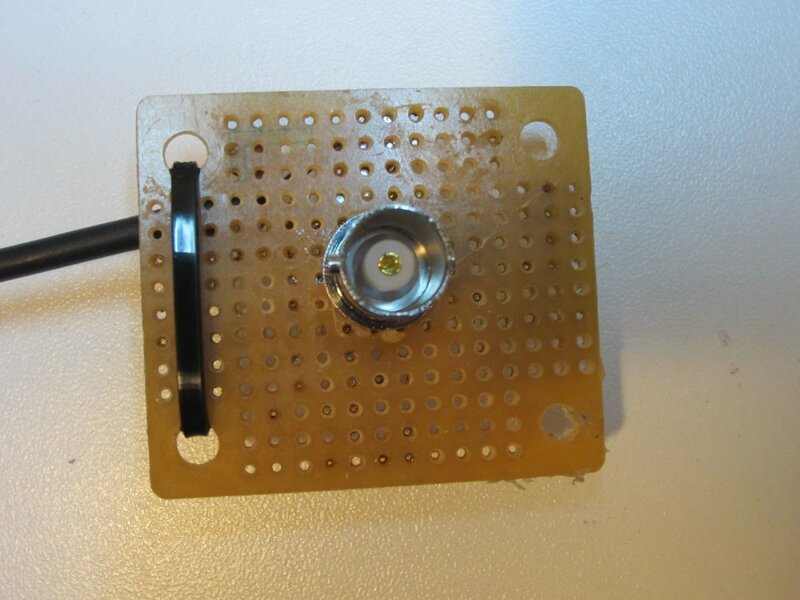 In this post, I will show you the one I built using a general purpose BJT as well as some rise time measurements. R2, C1 along with the NPN transistor form a relaxation oscillator. The capacitor gets charged via R2 and then rapidly dischargs when the collector-emitter voltage reaches the avalanche voltage. The discharge current flows through R1 during the avalanche and forms a fast-rise pulse between ground and the emitter. The choice of R2 and C1 is pretty liberal. In general, C1 can range from a few pF’s to tens of pF’s and R2 can range from 100K to 1M. The larger the value of C1, the wider the avalanche pulses due to increased discharging RC (R1C1) constant. But C1 cannot be too large as the energy released during the short avalanche period could cause the PN junction to fail. The RC constant (R2C1) determines the operation frequency. For the values given, the pulsing frequency is at roughly 30 kHz. R1 is chosen to match the characteristic impedance of the load. When used with an oscilloscope with 50 Ohm input, R1 should be 50 Ohm as well to avoid degradation of the output pulse waveform due to signal reflection. R3 biases the collector-base junction. And according to the avalanche characteristics curve, it should be chosen small enough to allow a strong avalanche pulse. When experimenting with different transistors, R3 can be replaced with a 20K potentiometer and the optimal operating point can be adjusted empirically. Filter capacitor C2 (100nF is usually sufficient) is optional, depending on the stability and the ripple characteristics of the power supply. If you are interested in the detailed operating principal of an avalanche pulse generator, you can take a look at this paper. The majority of avalanche pulse generators hobbyists built used 2N2369, the same transistor used in Jim Williams’ original experiment. One of the main benefits of using 2N2369 is that it can avalanche at a relatively low voltage (under 90V). But most general purpose NPN transistors such as 2N3904, 2N2222, SS9013, etc. can be used in avalanche mode as well. Andrew Holme for example, had built such a pulser using the popular 2N3904. I have also found 2N3904 to be a great alternative to the hard-to-find 2N2369, despite having a slightly higher avalanche voltage threshold. During my build process, I sampled a large batch of 2N3904’s, and found that most can avalanche pretty consistently at around 100V. To generate the high voltage needed by the avalanche pulse generator, I used an LT1613 DC-DC converter chip. The output voltage (determined by 1.23*(1 + R1/R2)) is then quadrupled to just above 120V. The performance of LT1613 is comparable to the DC-DC converter Jim used (LT1073). Like LT1073, LT1613 can also be operated at a very low voltage, using a single 1.5V battery. Note that in Jim’s original HV circuit with LT1073, the feedback resistor was located at the HV output of the voltage multiplier, whereas in my circuit I left the feedback point at the primary output and leaving the multiplier voltage unregulated. 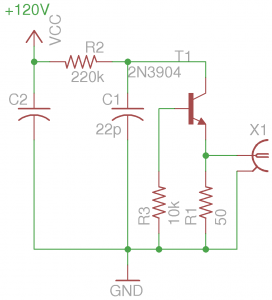 The reason for this decision is that should R2 become unconnected the voltage input to the feedback pin will remain be within tolerance, avoiding any possible damage to the chip. Also, since the current requirement for the avalanche pulse generator is very low, regulating the HV output is not strictly necessary. 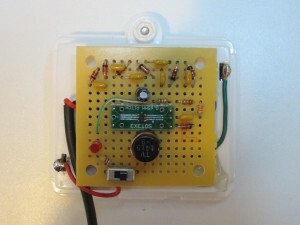 Below is a picture of the HV DC-DC converter built on a proto-board. In my particular build, I used a 4.5V battery holder which fits nicely behind the board. As I mentioned earlier, LT1073 can operate over a large voltage range and you could use a single 1.5V battery as well. To keep the stray capacitance/inductance as low as possible, leads were kept short and components were placed as close to the BNC socket as possible. The layout of the components has a direct impact on the rise time of the generated pulses. In an earlier experiment while I was testing out the avalanche voltages of various transistors, I used a less strict layout and there was an observable reduction in the measured rise time (up to 100 pS). Here is an oscilloscope capture of the generated pulse on a Rigol 1102E (100MHz bandwidth) and the measured rise time is roughly 2.5ns, which translates into a bandwidth of roughly 140MHz (BW=0.35/Tr). 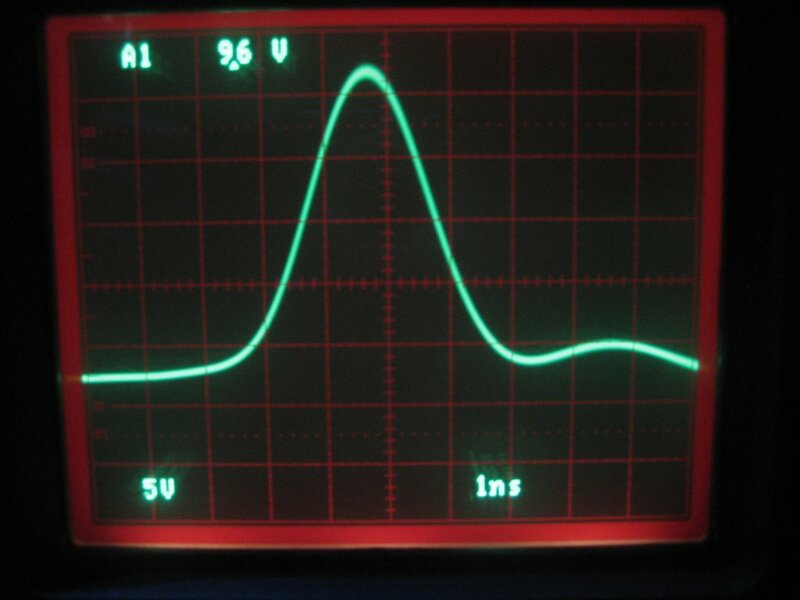 Ideally speaking, the scope’s input impedance should be adjusted to 50 Ohm to match that of the pulse generator. Since Rigol 1102E does not have a 50 Ohm input option and I did not have a 50 Ohm feed-through terminator at hand the pulse was fed into the oscilloscope input directly. The resulted ringing due to signal reflection was manifested as a much slower falling edge. The following picture shows the same pulse observed on a Tektronix 2445 (150MHz bandwidth) with matching input impedance. The measured rise time is around 1.5 ns which corresponds to a bandwidth of approximately 230 Mhz. 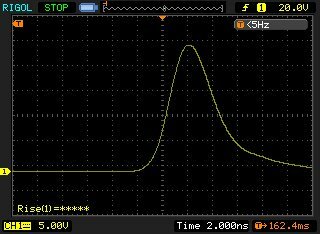 As you can see, the pulse has a sharper falling edge compared to the previous scope capture due to the matched impedance. Using a fast-rising pulse to measure rise-time tends to give overly optimistic rise-time estimates as the pulse may not have reached its peak before falling off due to the short pulse width and the limited bandwidth of the instrument under test. More accurate measurements can be achieved by using a coaxial delay line or a pulse shaping network to widen the peek of the pulse. Small correction. In the text “The discharge current flows through R2 during the avalanche and forms” should say R1. I much enjoyed reading Your Paper about the use of such common types of Transistors to generate the Avalanch Effect! The most common Transistors we use (low power) are the 2N2222A and 2N3904. Generally, we use the SMT versions (SOT-23), unless we are (just) breadboarding something. What I could not gather from the Article, although I could “crunch the numbers”, is what would happen if/when I connect a Load, such as an LED or “other” Device to the Output. I’m not sure there would be enough Drive Current, or Drive Voltage. Perhaps You could share some insight into this Interest Area. I see HV Avalanch Circuits, such as for E-O Modulation, such as Pockels cells, which can be used for “other” Projects. My Main Interest, is for (Semiconductor) Loads that in CW Mode Operate at 5 Volts and 1 Amp, for example. Instead of CW Mode, we need to pulse them (30KHz would be dandy as a Rep. Rate), for a few nanoseconds (2-6 nS). Any Ideas? Again, I found Your Paper very helpful. I would like to make a generator for myself with little modification. 1) the rise time bet. 1 nS to 10 nS. 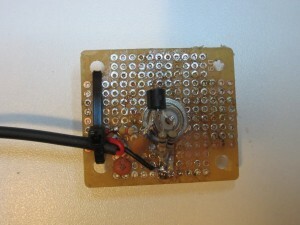 2) The voltage accross 50 ohm resistor bet. 5V to 60V. 5) Also would like to use an avalanche transistor if recommended. 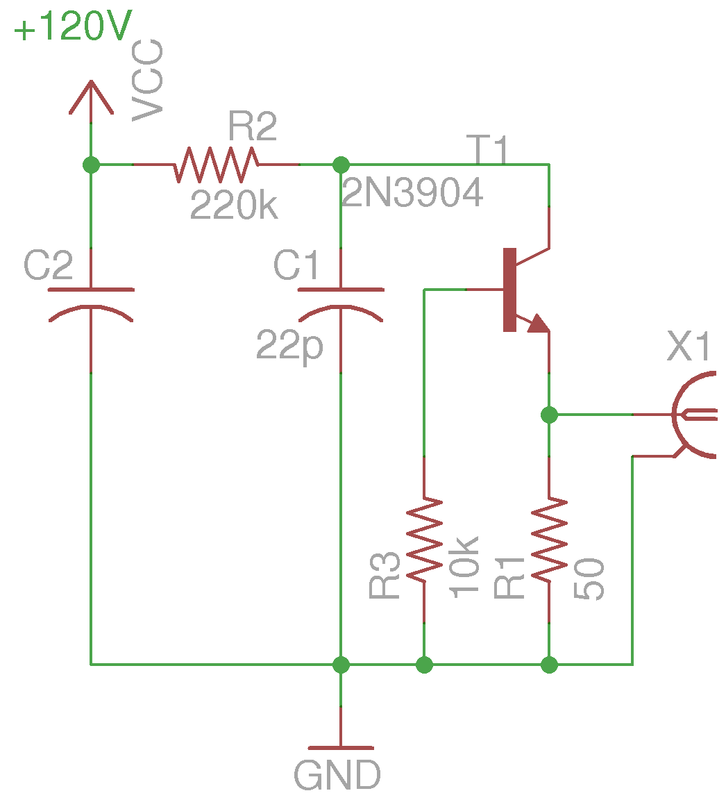 Is it possible to achieve this using the same basic circuit with little changes? If so can you suggest changes? The rise time is determined by the avalanche characteristics of the transistor and cannot be easily adjusted. Typically the rise time of an avalanche pulser is far shorter than 1nS. That said, you could add a small RC network to delay the rise time of the output. The output voltage can be adjusted somewhat but not via a voltage divider. But you will need to ensure that the output impedance remains 50 Ohm when doing so to avoid reflection. A side effect this divider is that it will affect the rise time of the signal due to the stray capacitance (e.g. 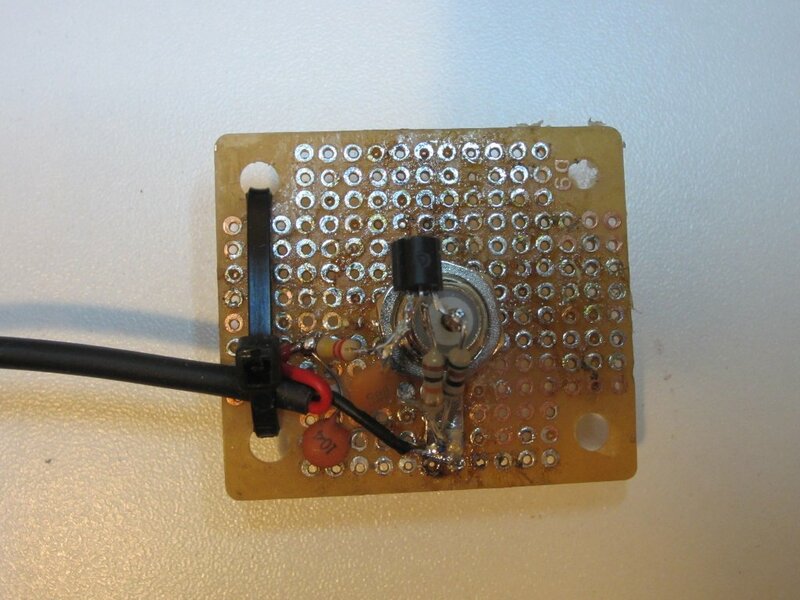 a parasitic RC circuit). The pulse rate can be adjusted by experimenting with different value of C1 and R2. Depending on the characteristics of the transistor you use, the frequency varies. I have dropped the idea of making it but instead like to buy. You know anyone who makes these generators and are for sale? Hello, I want to power solenoids coiled with coaxial cable. If I use the avalanche generator with high frequency (Mhz), will I be able to power my solenoids? I have the same question as “”””sean”””: how about feeding a solenoid with this pulser ? For very strong magnetic fields. Do you know any avalanche transistor which has rise time 1nS or less and work upto 500V? The schematic shows C3 through C8 are 1 microfarad? That doesn’t seem right at all. Yes, these are all 1u caps. Since the current requirement is very low, 1u is sufficient. Thanks! They look so small on your board. Are they tantalum or something? Do the caps and diodes get exposed to the HV output? 1N4148 has 100V max and caps at that voltage are huge. Since this is a voltage multiplier, each diode and cap does not see the full voltage. The input voltage is 30V after LT1613, so the voltage the capacitors and diodes must withstand is less than 50V. 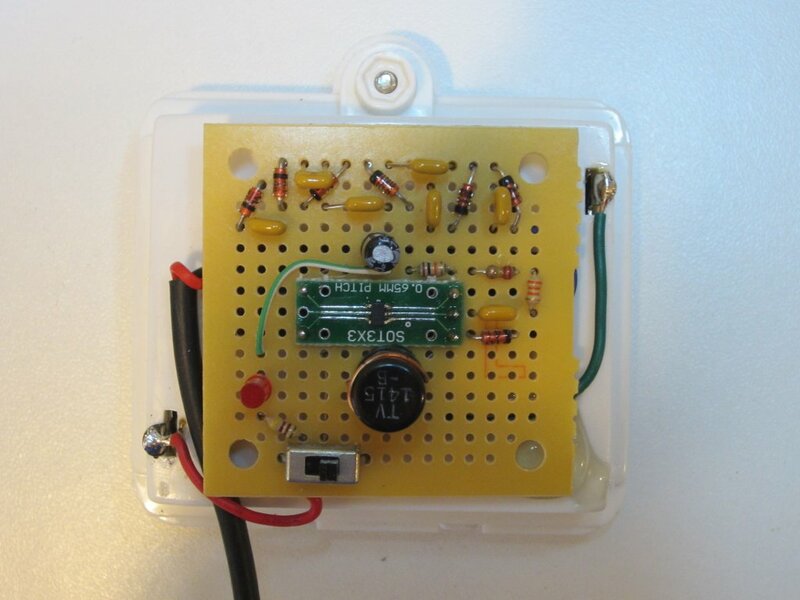 I just built one of these using the flash circuit from an old disposable camera as the voltage source.Gets up to 330v with the capacitor supplied. The problem I find is that using a female BNC connector to build the circuit means that connecting it to the scope even with a 50 ohm terminator,I have to use a short piece of coax.The pulse on my Tektronix 465 has a lot of oscillations after the fall time which suggests reflection between the connectors and coax.I think it would be better to use a male BNC connector with the rear end shortened.How did you connect the generator to your scope to get clean traces? I connected mine to the scope with a BNC Tee. Also I am not sure if you have the option to select the scope input to be 50 Ohm?